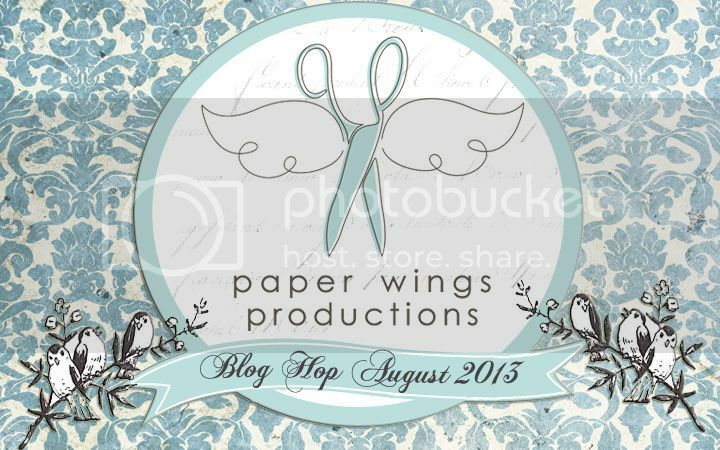 Welcome to the “Vintage” Paper Wing Production's Design Team Blog Hop & Giveaway! 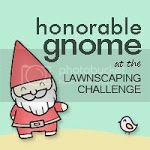 If you've arrived here from Norma Gomez's blog, then you're in the right place. If you’re just stopping by for a visit, please CLICK HERE to start from the beginning. This month we’re sharing beautiful vintage themed projects and some of our new designers are making their Paper Wing Productions debut...so make sure to give them a hearty and warm welcome. I am sure they will wow us all with their vintage art! Now it's time to grab a nice tall glass of something cool and refreshing and prepare to be inspired!! 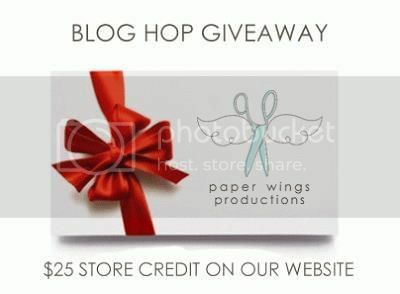 This month’s main prize is a gift certificate to the New Paper Wings Production’s online store. 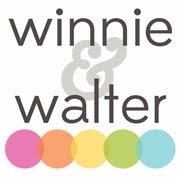 The winner will be announced on Tuesday, August 6, 2013 on The Aviary. Now are you ready to see my spin on vintage? You sure? It isn't what you would expect! 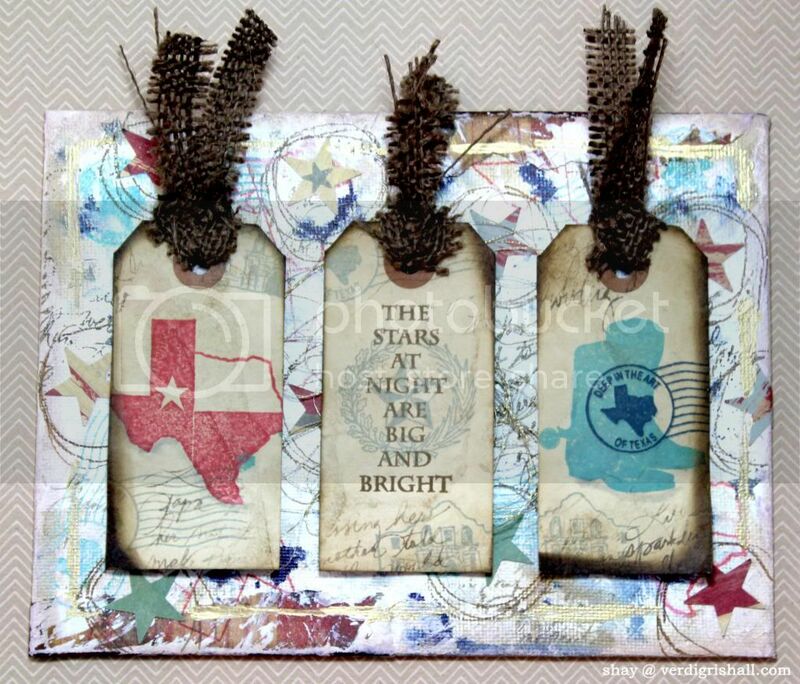 Because of all the Texas themed stamps available from Paper Wings Productions I went a little honky tonk and used the same format as last month with a tag art canvas. The background began innocently enough. I started much like I did for my sea inspired piece from last month with some stamping, distressing of the edges and drips of mist. Then I keep on adding distressing, images, color and a little bit of patterned paper. Somehow it looked too dark so I added globs of gesso in a haphazard way with a strip of cardstock as an applicator. Mist started to spread, I used a heat embossing gun to do some quick drying and added more gesso. Then I scraped off gesso. I added more stamping, ink, patterned paper stars and the like. 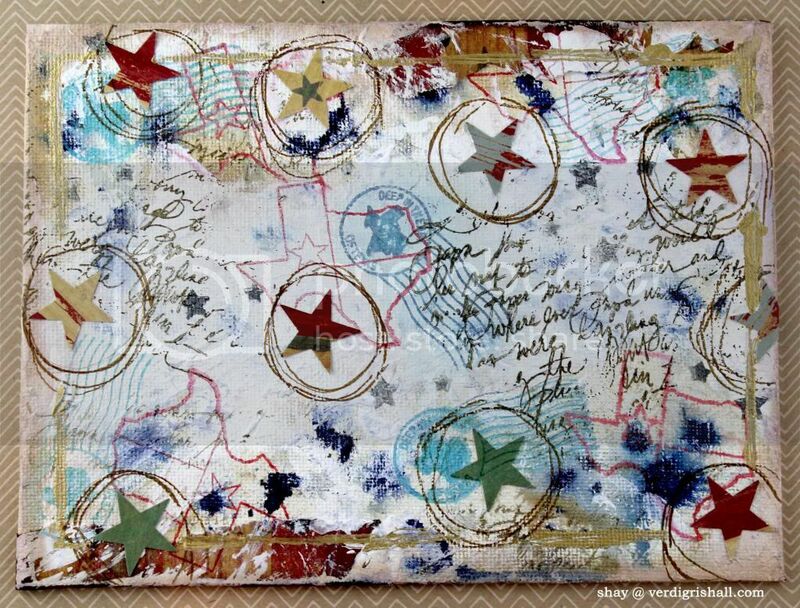 For the background I used Texas State or Deep in the Heart of Texas, Hanging Stars, Lone Star and Writing Backgrounds or Writing stamps. I also added a border using a gold leafing pen. 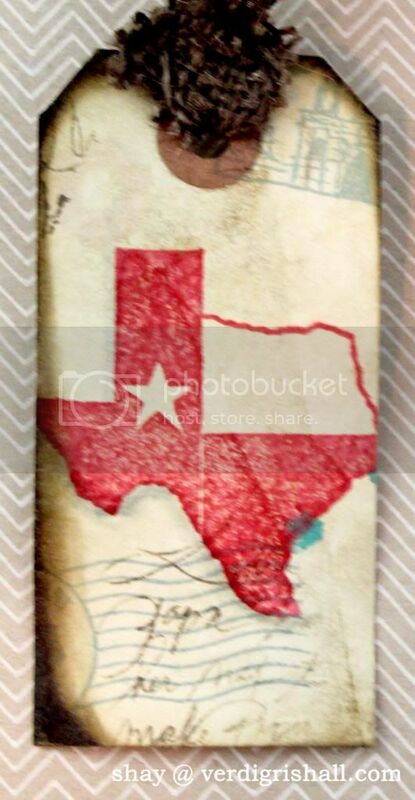 On a coffee stained tag I stamped the Texas from Texas State or Small Texas State using red and pink Distress Inks. To add interest I stamped the Texas cancelation seal from Texas State or Deep in the Heart of Texas and the Alamo from Texas Melange or Remember the Alamo in grey ink and the writing from Writing Backgrounds or Writing in brown ink. I tied a strip of brown burlap to the tag. On a coffee stained tag I stamped the sentiment from Texas Sayings using brown ink. To add interest in grey ink I stamped the star from Texas Melange or behind the sentiment, the Alamo from Texas Melange or Remember the Alamo also in grey ink and Texas cancelation seal from Texas State or Deep in the Heart of Texas and the writing from Writing Backgrounds or Writing in brown ink. I tied a strip of brown burlap to the tag. On a coffee stained tag I stamped the boots from Lyrics or Walking using blue Distress Inks. Over the boots I stamped the Texas cancelation seal from Texas State or Deep in the Heart of Texas in dark blue. To add interest in grey ink I stamped the Alamo from Texas Melange or Remember the Alamo and the writing from Writing Backgrounds or Writing in brown ink. I tied a strip of brown burlap to the tag. Behind the middle tag I added a nest of gold thread. And there you have it! It has been an absolute pleasure to have you visit me today and I hope this hop inspires you to ink up some Paper Wings Productions stamps! Fantastic project! Love the background a lot! Fabulous background and love the tags they are fabulous. I especially love the sentiment. Fabulous! I like the busyness and all of the layering you did of products. It turned out beautifully! Great job! Shay you always come up with a fantastic project! I LOVE this! Awesome job with the stamped background! The little tags are so fun. Thanks for the inspiration! Another amazing tag canvas, love this! Beautiful background, Shay! And I love your tags! WOW!! I LOVE YOUR PROJECT!!!! 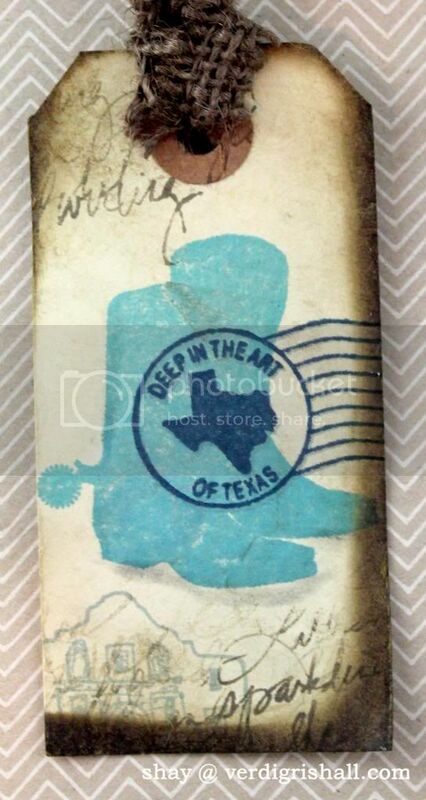 I AM SO IN LOVE WITH THESE TEXAS STAMPS!! THANKS FOR SHARING!!!! Yee Haw!!! I love it! You always come up with such creative projects! This is so awesome!! The background is fabulous!! The tags look amazing!! Love it!! I served there and had my boy in San Antonio! Shay, I am so loving your background!! It's stunning and the Texas theme is such a fun twist for the hop. Now you know, I can't help but sing along, lol!! Yee Haw Shay, your Texas tag canvas is the bees knees. I love the many-layered background. 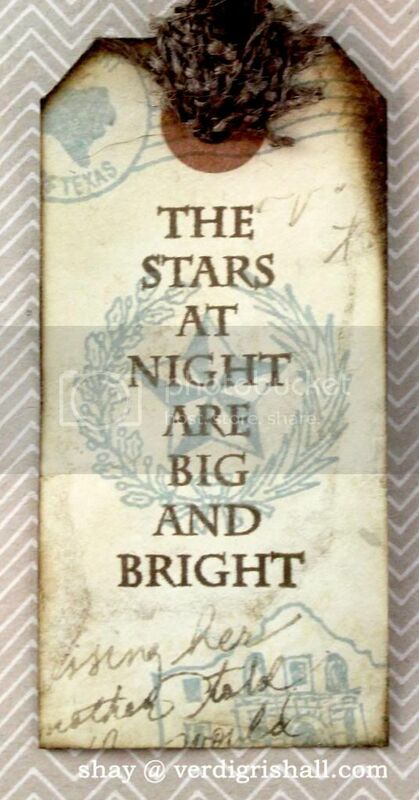 This is fabulous, I just love the stamped and colored back ground and the tags are fabulous too! Shay,your background is a work of art in itself, but of course the tags add that bit of pop! to the project. Vintage Texas is awesome, and such a great idea! You're the best! Your tags are fun, and Texas has been around for quite a while, so it's vintage! What a fun piece! 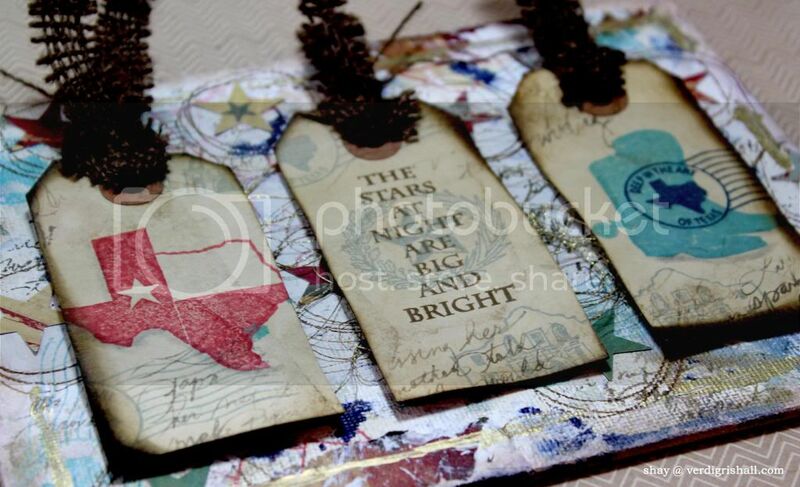 I love how the background is decorated with the stars and circles and love the layered stamping on the tags. This evokes Texas very clearly and accurately! I love it!